Not implemented (yet), Add new comment. 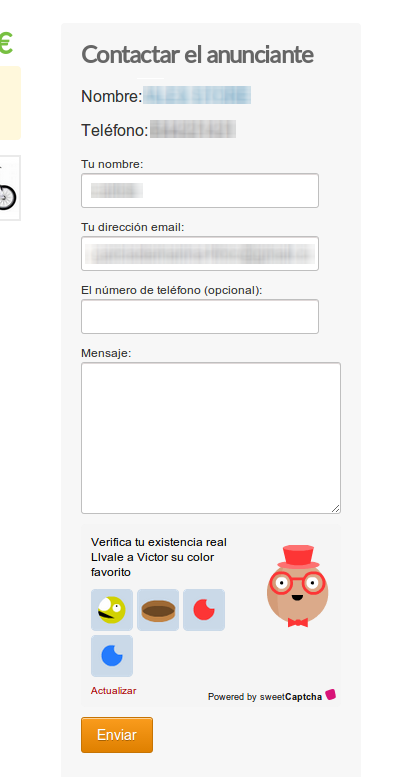 First if you don't have a sweetcaptcha account, you can create a new one here http://sweetcaptcha.com/. This plugin has been tested but I want to share it here and get some feedback befire consider it stable. I will appreciate any kind of feedback and I will try to release a basic version of it once I'm sure there aren't much issues. Thanks for helping me with your feedback. hi thank you for this plugin! its working perfectly! but I would like the sweetcaptcha validation error! instead of osc error flash msg! thank you! and great work! Before install the plugin This plugin needs to include code on some theme files. Be sure the plugin is installed and configured with application credetials before modify any theme file,if not application will crash. My thoughts also = too cheesy of comics but maybe others can use this. How it works on device without mouse/touchpad (older phones....) ? Great work Carlos, will test it soon! The plugin really works great! However, I had a small isue with the plugin submenu, it was showing under More Edit plugin submenu for some reason, so I took the liberty and modified that part of the code. Also added Config Link in Plugins Table as a shortcut. I have also moved all the hooks at the end of the index.php file (the "old school way"), and really hope you will approve the changes. Forgot, also moved admin settings into subfolder. Well, this is as far as my knowledge permits me to contribute. Again, thank you for the wonderful plugin! The page will be redirected to domain.com/index.php AND show correct registration form - how is this possible? Now, this won't be noticed as an issue on a plain installation with default theme, but in case of using SweetCaptcha, plugin won't load and user will have a hole to bypass security registration system! Thanks for the notice, I will investigate this issue. Well this plugin is in development and it's a plugin I want to use on a site that I have. Hi! I know this thread is old but I need some captcha solution for older versions of osclass. Appears this sweet capcha is no longer supported - their website is some kind of blog now. Do you guys know any other captcha solution for v3.0.x?